A pink leather bomber jacket and blue ripped skinny jeans are a perfect combo to be utilised on off-duty days. Complete your ensemble with Stella McCartney Elyse Metallic Star Platform Oxfords for an added dose of chic. For relaxed dressing with a modern spin, you can easily dress in a navy and white horizontal striped cropped sweater and a black maxi skirt. Why not throw in a pair of Stella McCartney silver leather oxford shoes for an added touch of polish? Opt for a blue coat and white sweatpants for a standout outfit. To introduce a little flair to your look, rock a pair of silver leather oxford shoes. If it's comfort and functionality that you appreciate in an ensemble, reach for a white dress shirt and white shorts. All you need is a pair of Stella McCartney Elyse Metallic Star Platform Oxfords to complement your look. If you love casual combos, then you'll love this combination of a red oversized sweater and black pajama pants. 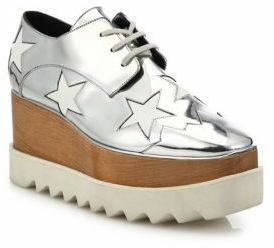 For a dressier touch, why not introduce Stella McCartney silver leather oxford shoes to the mix? A white coat and a black mini skirt are absolute staples that will integrate well within your current off-duty routine. Take a more elegant route with footwear by rocking a pair of Stella McCartney Elyse Metallic Star Platform Oxfords. If you enjoy comfortable style, consider wearing a white lace midi dress. 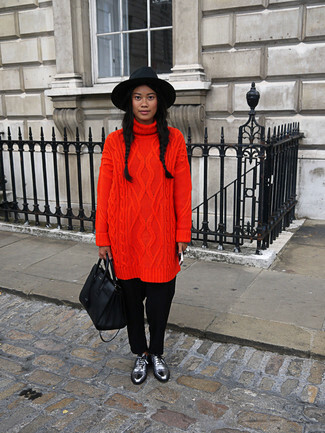 Complete this look with a pair of Stella McCartney silver leather oxford shoes to tie the whole thing together. This laid-back combo of a black and white chevron long sleeve t-shirt and navy plaid skinny pants can take on different nuances depending on the way you style it out. Go ahead and add a pair of Stella McCartney Elyse Metallic Star Platform Oxfords to your ensemble for an added touch of chic. Opt for a black and white horizontal striped v-neck t-shirt and a blue floral pencil skirt for a hassle-free ensemble that's also well put together. Finishing off with Stella McCartney silver leather oxford shoes is an effortless way to infuse a touch of class into your ensemble.